When the Europeans first came to this area, this crossing of the Huerfano River had been a game trail followed by travelling Apaches, Utes and Comanches for many years. The first recorded Europeans to pass by here were members of the Spanish expedition led by General Juan de Ulibarri. Ulibarri's diary, from July, 1706, says, "Thursday, the twenty-ninth, we set out from the Rio de San Juan Baptista (Badito)..." They had come here after passing over Cuchara Pass, west of "La Tetas de Dominguez" (the Spanish Peaks) on their way north from Santa Fe and Taos to recapture a group of Indians from Picuris Pueblo. From his sparse description, Badito is most likely where they crossed the Huerfano on their way to El Cuartelejo, a Jicarilla Apache settlement somewhere "out there" near the Arkansas River. 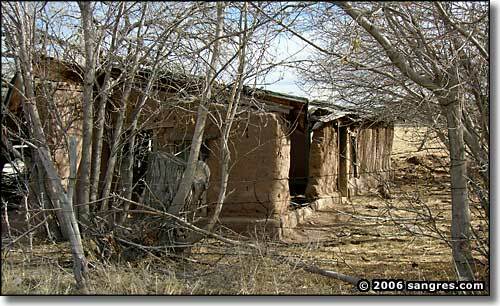 On September 3, 1779, Juan Bautista de Anza (then Governor of Nuevo Mexico) and his men spent the night here after defeating Cuerno Verde and his Comanches along the Greenhorn River about 15 miles northeast of here. 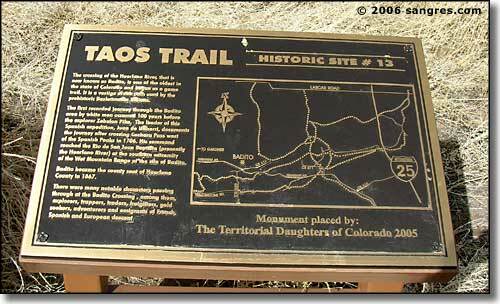 After Zebulon Pike and his expedition came through the Wet Mountain Valley in 1806, Spanish Viceroy Venadito ordered the construction of a fort along the Trapper's Trail that led through here and over Sangre de Cristo Pass into the San Luis Valley and then south to Taos. Between Ulibarri's visit in 1706 and Pike's expedition in 1806, records still available indicate that more than 1400 Spanish, French and Americans passed through Badito Crossing. In 1819, Ben Facundo Melgares, Governor of Nuevo Mexico, finally established a Spanish fort just east of Badito on the Huerfano River. In 1820, when Mexico declared its independence from Spain, the Spanish military abandoned this fort and left this whole part of the New World. In February of 1822, Jacob Fowler wrote of leading his crew of trappers south from Greenhorn Creek along the foot of the mountains about ten miles to Apache Creek and then about five miles further to the Huerfano where he found the remains of the Spanish fort. There he and his men camped for the night. The road which goes up the hill directly south of Badito Crossing was originally made by US Army troops under the command of John Gunnison in 1853, as he and his expedition were on their way to cross western Colorado and then die in Utah. This road was a two-track until it was widened by the WPA in the 1930's. Eventually, it became County Road 520. 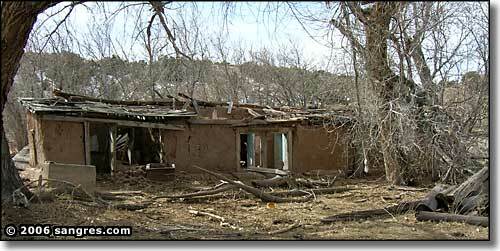 In 1850, the population of what we now know as Huerfano County was 25. Badito became the county seat in 1867 after the first county officers were elected in 1866. County Record Book #1 states that these first officers were: John Brown, County Clerk; John Berrand, Sheriff; Benton Canon, Treasurer; with John Brown, Ben Doss and H. Sebring as County Commissioners. The new Historic Marker replaced an older one: a sheet of paper lacquered to a large boulder.